Houghton Mifflin Harcourt, 9780151013876, 352pp. 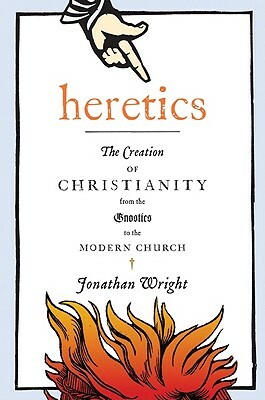 In Heretics Jonathan Wright charts the history of dissent in the Christian Church through the stories of some of its most emblematic heretics—from Arius, a fourth-century Libyan cleric who doubted the very divinity of Christ, to more successful heretics like Martin Luther and John Calvin. As he traces the Church’s attempts at enforcing orthodoxy, from the days of Constantine to the modern Catholic Church’s lingering conflicts, Wright argues that heresy, by forcing the Church to continually refine and impose its beliefs, actually helped Christianity to blossom into one of the world’s most formidable and successful religions. Today, all believers owe it to themselves to grapple with the questions raised by heresy. Can you be a Christian without denouncing heretics? Is it possible that new ideas challenging Church doctrine are destined to become as popular as have Luther’s once outrageous suggestions of clerical marriage and a priesthood of all believers? A delightfully readable and deeply learned new history, Heretics overturns our assumptions about the role of heresy in a faith that still shapes the world. JONATHAN WRIGHT received his doctorate in history from Oxford University. He has been a Thouron fellow at the University of Pennsylvania and a fellow of the Institute for European History in Mainz, Germany. He is also the author of God's Soldiers, a history of the Jesuits that has been translated into nine languages, and The Ambassadors.